As you’ve probably noticed, I’ve become a big fan of infused simple syrups! They’re a great way to add depth to an otherwise simple drink. 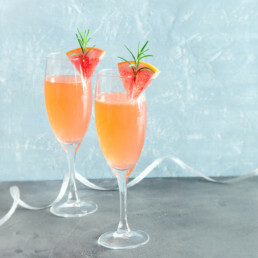 This Mimosa inspired mocktail uses rosemary syrup (one of my favourite herbs, rosmary is great for stimulating focus and memory), but the possibilities for other combinations are endless! Bring sugar and water to a boil (this happens quickly!) with rosemary stirred into it. Stirring often, boil for 1 minute or until sugar is dissolved. Remove from heat, place into fridge and let sit for 30 minutes. If possible, run the liquid through a sieve or cheesecloth. Chill before use. You can also make simple syrup in the microwave by placing the mixture in a glass tupperware container and heating it at 30 second intervals until sugar is fully dissolved. Put about 2 tablespoons Rosemary Simple syrup (recipe above) into a champagne glass. Fill the glass about 1/2 full with chilled grapefruit juice. Top with chilled club soda/seltzer. Garnish with rosemary and fresh grapefruit.